Our esteemed clients can avail from us the most preferred range of Conveyor Machine, Conveyors for Inkjet Printing. This Belt Conveyor Machine works as feeding and conveying equipment, used for transferring nature rubber. The machine comprises of Selection Reducer, a couple of chain wheels & chains principal wheel and a belt. It works in a very systematic and convenient manner. In order to feed the blocks, one of the chain wheel carries the other to work together when the Select Reduce move. The Principal Wheel is made to do circumgyration with the belt. This machine is sourced from the state of Gujarat in India. 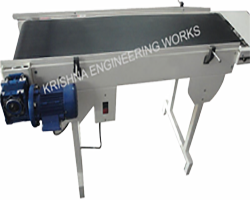 We specialize in the manufacture of Belt Conveyors and are one of best manufacturer and exporter of belt conveyors, Conveyors for Inkjet Printing in India, which you can avail at Offline Coding at competitive price with best quality. We have a huge range of Belt Conveyors, which are in demand due to its robust construction and tensile strength. Belt Conveyors are fabricated with superior quality raw materials and standard bought out items such as Gear Box, Motors, Belts and accessories, to give high strength and durability to conveyors system. Offline Coding provide best Belt conveyors for production flow line. Belt conveyors are employed for conveying various bulk and unit loads along horizontal or slightly inclined paths and for transporting articles between various operations and are the main means of mechanical transport. Belt conveyors make material handling easy and cost effective as it improves production process and save from human error. Offline Coding supply self-tracking belt technology, smooth product movements, and supplied standard with Geared motor or Drum roller drive. We can customize your equipment to suit your requirements. The belt can be on rollers, a link belt or slide bed. This style is simple but is an overly productive conveyor. 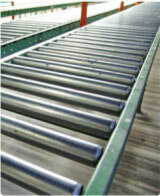 Offline Coding offer a range of advanced technology Roller Conveyors. Roller conveyors are the proper choice when you need to side load, push off, accumulate a product or adjust pressure on carrying rollers. Roller conveyor types are chain driven, belt driven, line shaft driven, accumulation, or non-powered (gravity). Using roller conveyors instead of slider bed conveyors adds versatility to the type of transfers, diverters and stops that can be used in a system. Rollers are available in mild steel, galvanized, plastic or stainless steel. We, Offline Coding are now a well reckoned manufacturer and exporter, amidst the chain conveyor manufacturers in India. 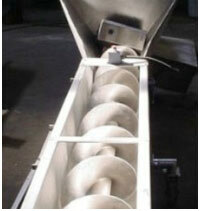 We offer all types of chain conveyors at most competitive price without compromising quality. Offline Coding, expertise in offering a robust and precision engineered range of Chain Conveyors, available in singly and multiple chains. Our multipurpose Chain Conveyors are manufactured, using latest technology and equipments to serve you quality, high functionality and user friendly operation. 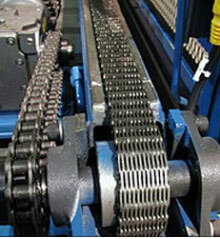 Chain Conveyors are widely used in automobile industries. Chain Conveyors allow for multi-directional and flexible movement of material. Unlike other Conveyors, Offline Coding system works permit horizontal as well as vertical change of direction. Our parts are manufactured for ultimate durability and functionality, each designed to enable you to move the chain in the direction required. 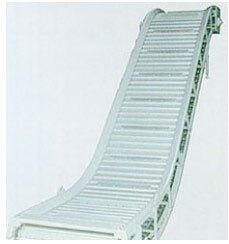 Apron Conveyors are used to carry materials and pieces horizontally and inclined lines. CPT offers Apron conveyors, which are made of pans with uneven edges to keep a check on material loss. Offline Coding offers Apron Conveyors which are flexible for adaptation to lifting loads from hoppers bins. Apron Conveyors can be regulated by adjustment of a sticker plate at the entrance point. Offline Coding have a heavy handle, which can handle abrasive and hot material. Apron Conveyors are capable of handling material up to 2000 per hour and does not cause noise pollution while carrying the material. Robust Structure -Apron conveyors made from high-grade steel are useful for handling abrasive materials, such as rocks and granules. Walls and overlap in the apron plates ensure minimal material loss, especially when transporting grains and detritus. Widly Used -Mainly used for industrial purposes, apron conveyors are made to withstand tremendous weight, heat, and continuous operation. 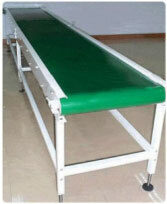 The conveyor can be treated with special coatings to achieve the desired surface, such as friction or elasticity. Offline Coding are recognized as one of the outstanding manufacturer and exporter of Slat Conveyors, as we offer Slat Conveyor having one or more endless chains to prevent overlapping and interlocking spaced slats. They are similar to modular belts in their versatility and use. They are able to transfer product around bends using a single drive. Slat belt conveyors, however, tend to be used in narrow accumulation applications such as bottling or engineering where single lane product transfer is required. Offline Coding, produce both a standard range and bespoke range of Slat Belt Conveyors, fully designed manufactured in house from our facilities in Noida encompassing the widest range of applications and environments. Offline Coding are one of the prominent Manufacturer and Exporter of the cutting edge technology of Wire Mesh Conveyors. Wire Mesh belt conveyors are mainly used for high temperature applications such as transferring products through tempering or cooling ovens or when handling hot product. Belts are usually made from either steel or stainless steel with varying degrees of weave and pitch. Offline Coding, produce both a standard range and bespoke range of Mesh Belt Conveyors, fully designed manufactured in house from our facilities in Noida encompassing the widest range of applications and environments.